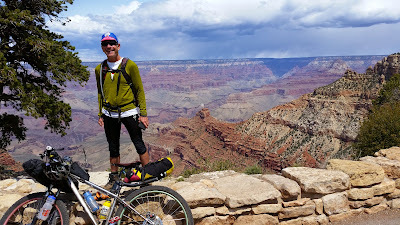 A few days after our Picketpost bikepacking ride I received an invite from Ben to join a large group from the St. Johns area on their annual Grand Canyon hike. Ben knew I'd be itching to get outside while my wrist healed up and who was I to turn down a hike into one of the 7 Natural Wonders of the World. It was set, $40 got me a camping location for two nights and 5 meals. No brainer. I did a few short hikes after my beatdown in the Huachucas. I was as ready as I was going to be. So, what hike were we going to do? The only kind I know, strenuous. We'd camp out Friday night at Mather Campground then hike down the South Kaibab trail to the Colorado River. There would be no overnight camping at the bottom, so the trek would continue along the river for a bit then turn south and climb back up to the rim via the Bright Angel trail. GPS models were showing something around 17 miles total. 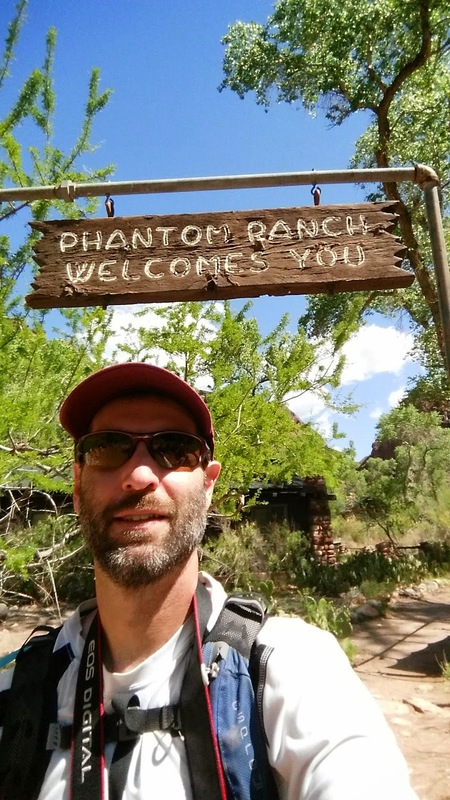 Way back in 1994, my buddy, Adam, and I did a one day hike on the Bright Angel to Phantom Ranch in a day. It was wicked, even on 23 year old legs. I was really looking forward to the challenge, but also knew my knees could be an issue. This time I had a small bailout option if needed. I could always skip the inner gorge and take the Tonto trail across the plateau and save some descending and ascending. I'd play it by ear. I arrived Friday evening a bit after sundown and found what I thought was the campsite. Slot #3, but it was empty. All the other campsites were occupied. Maybe they were running late? I double checked down at the now closed camp host shack, #3 was posted as our site. I just started to set up my tent when a call came in. It was Mike, the organizer, returning my call. They were at group site 3, I was at the wrong 3!! A quick change and Ben met & led me back to our location which was bustling with over 80 people!! I had been expecting a very cold night down in the 20's, so all the car camping comforts came along. I was bundled up and slept great. The next morning wasn't quite as cold as the forecast. I was ready to go! Bundled up for the start. The first named overlook on the S.Kaibab trail: Ooh Aah Point. This was my first time down the S. Kaibab trail, which also doubles as the Arizona Trail. This will be my route next spring with my bike strapped to my back as I make my way towards the AZ/UT border. The only way bikes are allowed below the rim in the Grand Canyon is with the stipulation that the wheels DO NOT touch the ground. It's part of the charm for the AZTR750. I was also very eager to see the condition of the trail. Overall, it wasn't too bad as long as you don't mind a million waterbars. I didn't, my stride was the right length. 30 minutes in, temps were warming up. Waterbars & switchbacks were on tap. Approaching Cedar Ridge rest stop. I took this opportunity to shed layers and grab a snack. At Cedar Point Ben & Kimberly told me not to wait up for them. I walk a bit faster and opted to keep my own pace going forward. I let them know of my potential bailout plans, but so far things were holding up well. Soft contours along the plateau. Popular Plateau Pt. trail can be seen here. Slicing across the face of O'Neill Butte. It was fun leapfrogging groups of hikers all the way down. A rare flat stretch of trail. Ready for another set of switchbacks? There was a rather large congregation of hikers at Skeleton Point. I kept moving not wanting to get stuck in someone else's party. My knees continued to hold up ok, a bit tired, but no shooting pains. The only real issues were the short cobbled sections of trail. These areas were dealt with slowly and didn't last long. The waterbars continued to be fine. As I neared the Tonto trail split I knew I'd be going for the full-meal-deal. First glimpse of the Colorado's turquoise waters. The trail is an engineering feat all by itself. You did say 'more switchbacks', right? Short break on their way up. This was it. Time for the final descent to the river. So far, the trail had been absolutely incredible. More. I want more!! The S. Kaibab delivered the goods. The lower you go, the farther back in time you get. Sense of scale is staggering. Brittlebush and Globemallows offered up yellows & oranges. Suspension bridge comes into view. The Canyon oasis of Phantom Ranch while a mule train makes its way up. Making good time and enjoying every minute. Rafters taking a break in the calm waters. I took a few minutes here, downed a small Gatorade after only taking one sip of water from the pack the entire way down. 21 years later, I'm back!! US mail delivered by mule. Three and a half hours in and I was chilling on the banks of the Colorado River. I opted for the short detour up to Phantom Ranch where I snagged a lemonade from the canteen and dropped my Mom a postcard delivered by mule. My knees weren't feeling too bad, nothing a Mountain Dew couldn't fix. 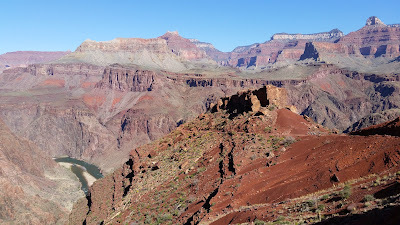 I relaxed in the shade for a bit, downed some calories then departed for the south rim via the Bright Angel trail. It was about 11:15a when I left Phantom Ranch and I was curious to see how long it would take me to reach the top. Back when I was 23, it took me 8 hours!! I wasn't prepared at all that day, cramping up something fierce over the final miles. I expected this day to be much different. Serenity on the Canyon floor next to Bright Angel Creek. Some big fish in there too! Vishnu Temple peeking over the suspension bridge. Quite a few construction projects were underway. You can make a loop hike on both bridges. The serpent carves its path. Rapids at Pipe Creek Beach. Rejuvenated from lunch, I was keeping a solid pace as the trail bent away from the river and began to climb in earnest. My quads, calves & lungs felt great - thank you mountain biking!! My knees were holding steady. For the most part I was in passing mode sans the occasional trail runner, which I am not. I marveled at the towering cliffs, the random waterfalls, the shear size of my surroundings. It was fantastic. An abundance of wildflowers throughout. Beginning to gain expansive views. Reminds me of the Gila River Canyons or is it the other way around? I was somewhere near a mile away from Indian Gardens, the halfway point to the rim, when suddenly the wheels came off. Both of my knees decided to revolt. Same as its been, left IT band, right kneecap. I took a few short breaks, slowed my pace - mostly due to necessity and set my sights on Indian Gardens. One by one, all the hikers I passed earlier were leaving me in the dust. I was in bad shape. I'm not used to my body not responding when I ask it to. I almost fell down while trying to step up a small waterbar on a few occasions. There were a few moments when I let doubt creep in about my ability to finish the hike. A quick self consultation kept me moving steadily towards my immediate goal. Deep inside my pain cave...on tame trail! I found an open bench in the shade and had a power snack & Coke. People watching didn't hurt either. The visitors to the Grand Canyon are quite the bunch. Well over half the folks were speaking a language other than English, it reminds you how amazing this place really is. You should probably visit some time. The 20 minute break was exactly what I needed. A few stretches later I was back on the trail. I also knew the Bright Angel trail was kinda mellow for the first bit out of Indian Gardens. I was hoping I could settle back into a rhythm and keep it steady to the top. One mile later, things were still going well. Thermometer was a bit high, maybe 80º. High pressure water line is part of the massive infrastructure of the Canyon. Indian Gardens begins to grow distant. Holding steady as the trail twists skyward. My short term goal was to make it here before stopping. (3 mile rest) I felt good & kept pushing. Took a 5 minute break between the 3 mile & 1.5 mile rests areas. Kolb Studio on its perch. First tunnel, nearing the top!! Kolb Studio and second tunnel. These two ran past me in a full sprint on their way down before Indian Gardens, didn't take them long to catch back up. All done! I was hoping to keep it under 10 hours total, and just made it. Around 5pm the shadows begin their show. I was so glad my knees found their second wind, still achy, but not too bad. I needed to find our shuttle to get back to camp as I wasn't really up for another couple of miles on my feet. I kept moving until I found the van. Back at camp I found Ben & Kimberly already there as they passed me while I was at Phantom Ranch. I showed Ben my 100oz bladder, I still had 50oz of water in it and I didn't get any the entire day. We talked a bit about hydration afterwards. On the day I drank a 12oz nutrition shake, 44oz of Gatorade, 2 12oz sodas, 12oz lemonade & 50oz of water. No sausage fingers, didn't sweat a whole bunch since it wasn't hot, used the restroom a couple of times and yes, my pee was normal looking!! I guess I tend to drink less than the average person. Maybe I'm acclimated well to the desert environment. Whatever it is, I felt great all day, no cramps, was never out of breath, only the knee issues. I guess some strength and conditioning regimens are in my near future. Needless to say, sleep was incredible that evening. On my way out the next morning, I met up with Rich Wolf as he was the last rider in the AZTR750. He had a free day since he had to wait for the Post Office to open on Monday before hiking his bike through the Canyon. It was great to finally meet him in person. We chatted for a while on the rim's edge before I wished him well on the final push to Utah. Inspiring fella. Rich made it to Utah a few days later. Congrats!! This guy was touring from Georgia to San Diego!! On my way out of the park I stopped by the IMAX in Tusayan to check out the AZT exhibit. It's pretty neat, the atrium of the building is covered in AZT tidbits and photos from a few friends adorn the walls. Next time I'll hang around to watch the video too. I was ready to get home. A portion of the 43 passages that make up the Arizona Trail. Of course Scott would get a photo of Oracle Ridge and the obligatory HAB'er. Thanks again Ben for the invite, it was just what I needed. I may just do it again. Humphrey's Peak north of Flagstaff.